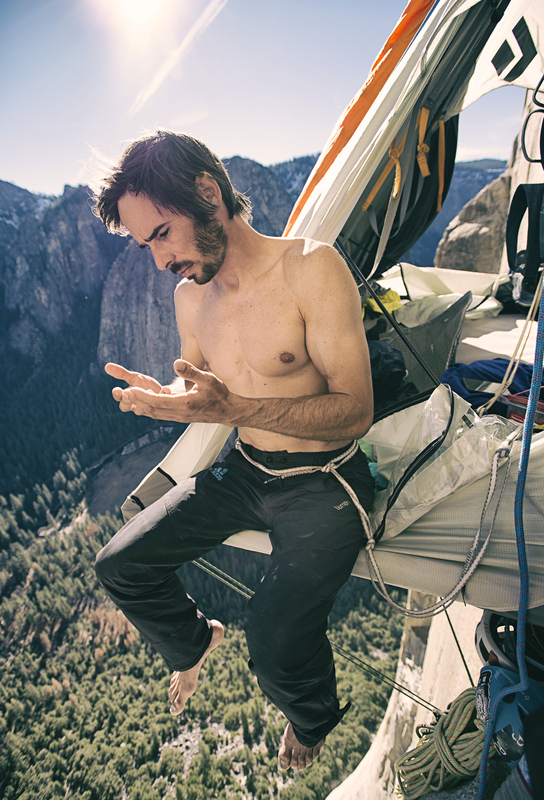 'It Looked Impossible': New Film Follows Free Climbers Up The 'Dawn Wall' Tommy Caldwell and Kevin Jorgeson were the first to free climb to the top of the southeastern face of Yosemite's El Capitan. "It's as sheer and as vertical as the side of a skyscraper," Jorgeson says. 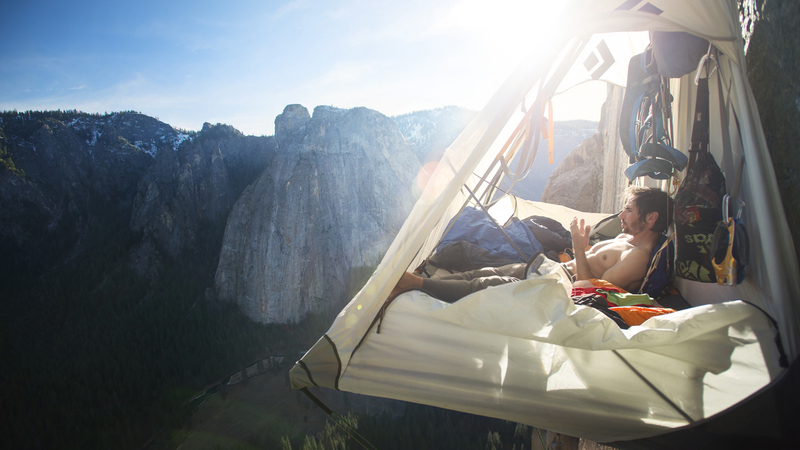 Free climber Kevin Jorgeson rests in a portaledge during his ascent of El Capitan's Dawn Wall in 2015. In California's Yosemite National Park, the summit of the iconic El Capitan rock formation looms 3,000 feet above its base. Though El Capitan's vertical granite has always presented a challenge for climbers, its southeastern face, known as the Dawn Wall, is thought to be the most punishing. And yet, for several days in January 2015, national media crews and a growing crowd of people stood at the base of the rock, craning their necks as they watched free climbers Tommy Caldwell and Kevin Jorgeson slowly make their way up the Dawn Wall. Free climbers can use ropes to catch them from falls, but not to help them climb. Jorgeson and Caldwell spent years planning their 19-day climb. "You could compare it to choreographing a gymnastics routine or a dance," Jorgeson says of the preparation. "It's highly precise." Part of the planning involved figuring out where in the rock's seemingly impenetrable surface they might find a small grip on which to rest a toe, plant a finger or anchor a portaledge-style tent. "These little tiny razorblade edges sometimes form [in the rock], and if you train yourself properly, you can learn to support your body weight," Caldwell explains. "Then, if you practice it enough, you can learn to move from one edge to the next." Caldwell and Jorgeson's historic climb is captured in a new documentary The Dawn Wall. Caldwell: El Capitan itself had been climbed a lot. Historically, it was climbed by aid, where you sort of attach these ladders to the wall and you climb the ladders. Free climbers got a hold of it in the early '70s, and so we started climbing it [with] just our hands and feet and the ropes were there to catch us. And there [were] about 12 routes on El Cap that had been free climbed, but they followed these distinct crack systems. To the right of center, though, was this big, vast, blank looking face, and to me that was the next level. It looked impossible. Climbing on El Capitan is extremely technical. You have to imagine that it's as sheer and as vertical as the side of a skyscraper. Jorgeson: Climbing on El Capitan is extremely technical. You have to imagine that it's as sheer and as vertical as the side of a skyscraper. But what's cool about vertical climbing is that it's very balance oriented. So if you have a nub big enough to stand on your feet, it often doesn't take a whole lot to grip onto for your hands in order to make it all work. It's this really delicate dance at times. Other times, it's really powerful and physical, but sometimes it's just really precarious balancing act moves. ... Picture a thimble or just your thumb sticking out from the wall — just a little tiny surface area. 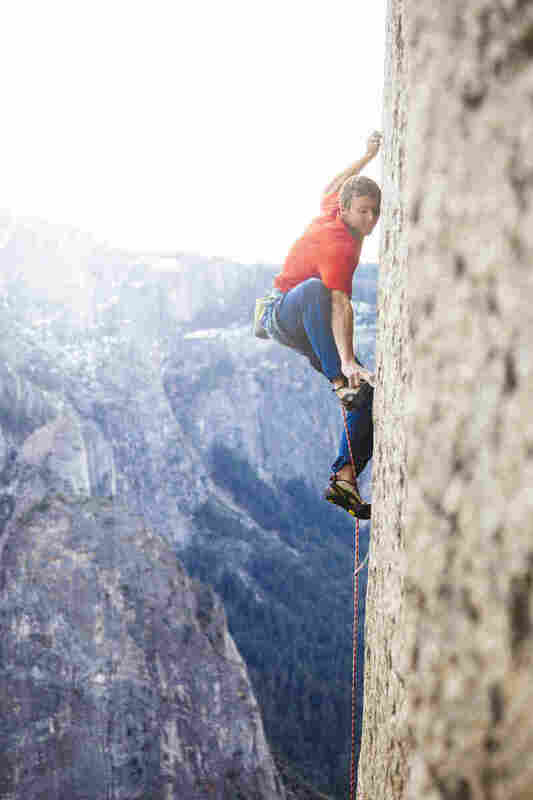 Tommy Caldwell uses "tiny razorblade edges" in the rock wall to support his body weight on El Capitan's Dawn Wall. Caldwell: A 200-foot rope is what we use. And as the first person climbs, they put in protection into into cracks. If there's no cracks, occasionally there's little holes drilled that have these bolts in them. And so, every 8 to 20 feet, you clip into one of these protection points. And so if you can envision that, if you're climbing above a protection point, say you're 10 feet above it, and you fall — you're going to fall 20 feet, plus a rope stretch. Then your belayer is holding the other end of the rope. That's your climbing partner. So the first person goes up putting in these pieces of protection. They stop. They belay. And the second person follows them up. And then you repeat that process over and over again until you get to the top. Caldwell: It's our little nest up on the wall. It's a hanging cot. It has a metal frame that's strung with fabric in between and it hangs from straps in a single clip-in point, and then a tent goes all around it. It's your little pod, and on El Capitan specifically, you end up spending a tremendous amount of time in these portaledges, it becomes your home. It's where you cook. It's where you sleep. It's where you eat. It's where you go to the bathroom. Anytime you're not climbing, you're in these portaledges. Jorgeson checks to see how much skin has grown back after a night of rest in his portaledge. Caldwell: On the Dawn Wall specifically I think our main danger was ice fall. We needed to climb in the middle of the winter for the conditions [to be right]. ... So we climbed in the middle of the winter, which meant every morning when the sun would hit ... ice chunks would come flying down the wall. So you have to figure out ways to deal with that kind of stuff. Complacency was a big one, since we were up there for 19 days, just overlooking being tied in properly. If you're a new climber, in some ways, you're safer, because you're aware of everything, you don't get complacent. But when you've been doing it as so long like we have ... one of the dangers is you just get too comfortable in that environment. Jorgeson: It's one of my favorite aspects of climbing is that it gives you these unique perspectives on the world that hardly anyone else gets to experience. So being up on El Cap, I mean, you get a perspective of Half Dome, you could look out to the west, you get to see Yosemite Valley through a really unique lens. Roberta Shorrock and Mooj Zadie produced and edited the audio of this interview. Bridget Bentz, Molly Seavy-Nesper and Beth Novey adapted it for the Web.